Adrien Gloaguen's new intimate and trendy hotel is located in the 9th district of Paris. In this new hotel, you will be welcomed like a family member. Make this place a cosy refuge, away from the hustle and stress of the outside world. Guests can relax and enjoy the Speakeasy bar with snack menus. You can also taste the delicious pastries made by Anais Olmer de Bogato and take pastry-making courses which are available for children, adults and groups. Quiet rooms and green spaces inside and outside the hotel will soothe your senses, in the heart of a vibrant area of the city. The hotel Bienvenue offers 37 quiet rooms. As you enter the room, you will feel like you are taking a step back in time to a classier day of glitz and gilt and magic. Amenities are plentiful and enhance your experience at this new hotel : air conditioning, ultra-flat LED TV 81 to 107 cm, minibar, safe, free Wi-Fi, private bathroom with shower or bathtub, toilet, branded toiletries and hairdryer. *Free: One child under 2 years stays free of charge when using existing beds. 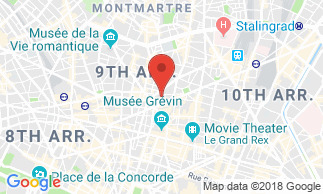 The hotel Bienvenue is located in the 9th arrondissement of Paris, just a 10-minute walk from the Printemps and Galeries Lafayette department stores, and the famous Theatre des Folies Bergere. Buffet breakfast is not included in the room rate : 16 EUR per person. It is served in the breakfast room from 7 am - 10 am.